I am putting together what I think will be a winning team for our event. I have already recruited a historian, a finance person, an economist and two people who closely follow diplomatic affairs generally. I am hard at work to add an expert in national security and someone with international trade skills. We want to be ready for any questions thrown our way. Of course the competition I am most worried about is the winning team from the high school competition - we know they will be tough! We are calling our team the "Shadow National Security Council" based on an event that occurred to us. Part of our team was at lunch one day, vigorously discussing the national security problem of Somali pirates. We noticed a gentleman pacing back and forth near our table. Finally, he worked up his courage, came up and said, " I didn't mean to eavesdrop, but I have been thinking about this problem as well. Perhaps you could pass along an idea I have about it. " He proceeded to explain a historical parallel he saw to the Somali situation and what that indicated to him might be a useful tactic. After he left we suddenly realized that he assumed from the vigor, if not the expertise, of our conversation that we really had an inside track to the defense establishment. His confidence was flattering, but misplaced! We will be doing our best to show what we know on Saturday night. The Greater Cincinnati World Affairs Council will host its first annual fundraiser for global education with its ONE mind — ONE World — ONE Night event at 21c Museum Hotel Saturday, February 8. Promoting global awareness throughout the Greater Cincinnati community is part of the nonprofit’s mission, so raising awareness about the educational programs it offers is a top priority. The fundraiser itself, which is a cocktail reception, dinner and team-based competition branded as an international challenge where “Jeopardy! meets Where in the World is Carmen San Diego,” is based on a model of one of its high school education programs, called Academic WorldQuest. Some of the organization’s other educational offerings include initiatives like Global Classrooms, in which international students from local universities prepare a presentation on their home country, then share it with local elementary schools. Harpenau says the international students love it because it helps them get over their homesickness. 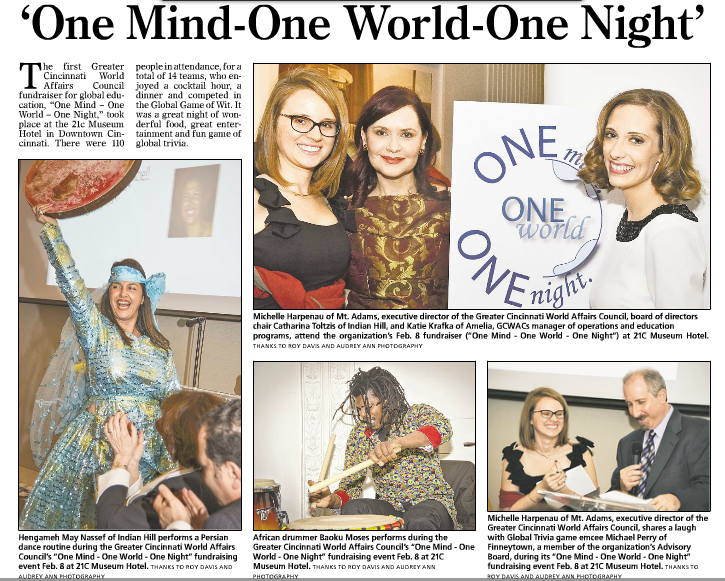 • Support the GCWAC by purchasing a ticket to ONE Mind — ONE World — ONE Night. • Support the GCWAC by becoming a member. • Like the GCWAC on Facebook, keep up with events, and choose one to attend. Brittany York is a professor of English composition at the University of Cincinnati and a project manager for Charitable Words. She also edits the For Good section of SoapboxMedia. The Greater Cincinnati World Affairs Council would like to welcome Michael Perry with Vehr Communications as emcee of ONE Mind - ONE World - ONE Night. He will be announcing all of the rounds and questions for the game of global wit. Get to know him better below. BIO: Michael Perry is a counselor and vice president of content strategy at Vehr Communications, a downtown-based strategic communications firm where he has worked since 2010. A University of Cincinnati graduate, Michael has led the introduction of new products internally and externally and been involved with the launching of new businesses using traditional and new media strategies. He spent 25 years in journalism as a newspaper reporter, editor and managing editor and has been a magazine and book editor. Michael is an adjunct journalism professor at UC and served as director of marketing and promotions for the 2012 World Choir Games. He is a member of Leadership Cincinnati Class 36. A former Cincinnati Enquirer sports editor, Michael is the author of "Tales from Cincinnati Bearcats Basketball" and "Xavier Tales: Great Stories from Musketeers Basketball," and served as editor of five books published by Pediment Publishing. He joined the Advisory Board of the Greater Cincinnati World Affairs Council in 2014. Meet the Princeton High School team who will play against the local professionals in a game of global wit! 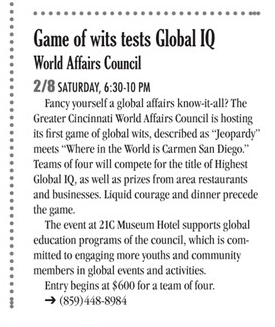 The Greater Cincinnati World Affairs Council (GCWAC) hosted the regional Academic World Quest on Saturday January 18th from 9am-1pm at the Cincinnati Museum Center. 11 teams from 6 schools competed in this local competition for a chance to represent the region in the national Academic WorldQuest in Washington D.C. and play in the the GCWAC's first annual global education fundraiser, ONE Mind - ONE World - ONE Night, against local Cincinnati professionals in a similarly modeled global trivia game. The schools that were represented in the regional competition were McNicholas High School, St. Henry District High School, Wyoming High School, Winton Woods Academy of Global Studies, Indian Hill High School, and Princeton High School. The teams were given 10 topics to learn about and were asked 10 questions per topic. Answering 84 out of 100 questions correctly, the team, Marky Mark and the Funky Bunch, from Princeton High School came in 1st place and the GCWAC will be sending them to represent the greater Cincinnati region in Washington D.C. In addition, Marky Mark and the Funky Bunch will compete against local professionals and play to win at ONE Mind - ONE World - ONE Night. We will find out if our local professionals are smarter than high schoolers on February 8th, 2014! This Saturday from 9:00 AM to 1:00 PM at the Cincinnati Museum Center, the high school global trivia competition will commence for the Greater Cincinnati region. 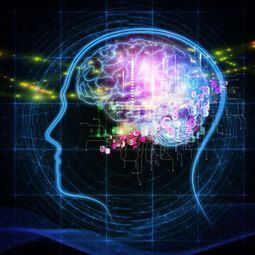 As a player for ONE Mind - ONE World - ONE Night, you may join as an observer for free to see the topics and hear the questions that the students will be asked as you prepare you and your teammates for February 8th, 2014. This is a great opportunity to brush up on your skills. At the end of the game, there will be a high school team of 4 who will win it all! This winning team will be a part of the competition at ONE Mind - ONE World - ONE Night along with 4 of their teachers. The high school competition is the model for the global education fundraiser event. About Academic WorldQuest (AWQ): AWQ is one of the flagship programs of the World Affairs Councils of America and one of the annual high school global education programs of Greater Cincinnati World Affairs Council. AWQ test students’ knowledge on international affairs and events and the competition puts Greater Cincinnati’s high schools against each other in a battle to be the ‘Best of the Quest.’ Topics have included geography, flags, current international events, foreign policy, alternative fuels, migration patterns, genocide, transnational crime and leaders. The first place team is sent to represent our region in the national competition in Washington, D.C.